One of the benchmarks that I find helpful to gauge the ILS arena among large academic libraries involves a long-standing chart that I have maintained that tracks the automation systems used among the members of the 123 Association of Research Libraries. These libraries generally represent the largest and best funded in the U.S. and Canada. Who�s in the lead? Depends on how you count. Innovative�s Millennium stands as the ILS with the most ARL adopters (38). 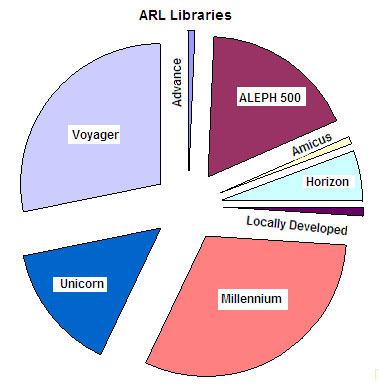 Ex Libris, however, now ranks as the company with the most ARL customers, since they can count both the 35 Voyager sites and the 22 ALEPH 500 sites. If you also include the libraries using other Ex Libris products such as SFX, MetaLib, Verde, and DigiTool, Ex Libris claims over 100 of the ARL�s as their customers. While the ARLs gravitate to a select group of systems, some follow a less traveled path. The University of California at Berkeley continues to operate the system that they developed locally; the National and Archives of Canada stands as the sole ARL using Amicus, The University of Montreal has announced no plans to migrate from Advance. The score hasn�t changed in a while. Now that New York University has decided to go with ALPEH 500 following their aborted implementation of Virtua, Ex Libris gains a point. The SirsiDynix announcement to discontinue forward development of Horizon inevitably means some redistribution, over the next 2-3 years. We�ll be watching those libraries to see if they stay with their incumbent company and shift to Unicorn (aka Symphony) or if they gravitate toward other competitors. So far, none of the ARL�s have selected an open source ILS. Any movement in that direction among this group of libraries will represent a remarkable shift in the library automation arena. But, then, who's keeping score? I guess I am. Over the last year, the library world has gravitated to Facebook and other social networking sites in a big way. In my column for the September 2007 issue of Computers in Libraries titled �Librarians face online social networks,� I gave an overview of online social network sites, featuring Facebook as an example. I find Facebook to be a great way to keep up with my colleagues around the world that I have gotten to know in my travels. I think that it�s important for those of us that work in libraries to gain some experience with these kinds of social networking sites that attract the interest of so many of our users. Facebook is just one example. LinkedIn has grown to be one of the main sites for making professional connections. I�ve just started to build my LinkedIn network. While I see all these sites as having great potential, it�s quite a challenge for me to make time to keep up with them. You can view a list of my other Systems Librarian columns published in Computers in Libraries. Well Linkedin is pretty different than all the other networking sites. Linkedin is very professional than any other social networking site. It can be termed as business networking site. More than fun people join Linkedin for purpose. I came across this site from some of the Blog which say Linkedin can be accessed over the phone without internet. In fact with this service, Linkedin access will be even more convenient than ever. One of the main components of Library Technology Guides is the lib-web-cats directory of libraries. One of the key features of this directory involves the data describing the automation system used by each of the libraries. With this information, I am able to measure the relative proportions of each automation system installed in libraries, and track trends of migration. Lib-web-cats lists 9,277 public library systems in the United States representing a total of 16,959 facilities. By using data from the National Center for Educational Statistics, at least a skeletal record exists for every library. While the NCES data gives me a comprehensive list as a starting point, it does not include the information that interests me such as the URLs of the library�s Web site, online catalog, and the current and previous automation systems employed. I�ve enhanced each listing with that information as I�m able to find it. For most libraries, I�m able to collect this information by visiting the Web site. Small rural libraries present the greatest challenge since many of them lack a Web site. While I�m confident about the data for mid-sized and larger public library systems, I�m continually scouring the Web for information on the smaller ones. I have created a few pages that present some of the trends, including a basic page for browsing through all US Public Libraries, one that shows ILS implementations, that links to reports to each state, such as this one for Tennessee. Gathering information on the library automation systems used by public libraries in the US has proven to be a never-ending project. I encourage anyone to send me information that might be missing from lib-web-cats. Any one registered on Library Technology Guides can add or modify entries. To ensure consistency and any possible malicious changes, I monitor and review all changes. One of the basic tenents of Library Technology Guides and my personal approach to the industry involves putting as much information in public view as possible. I see great benefit in creating a comprehensive resource describing the technology deployed throughout the country. Such a resource describes the current state of technology, provides historical trends, and helps inform decisions as libraries move forward.